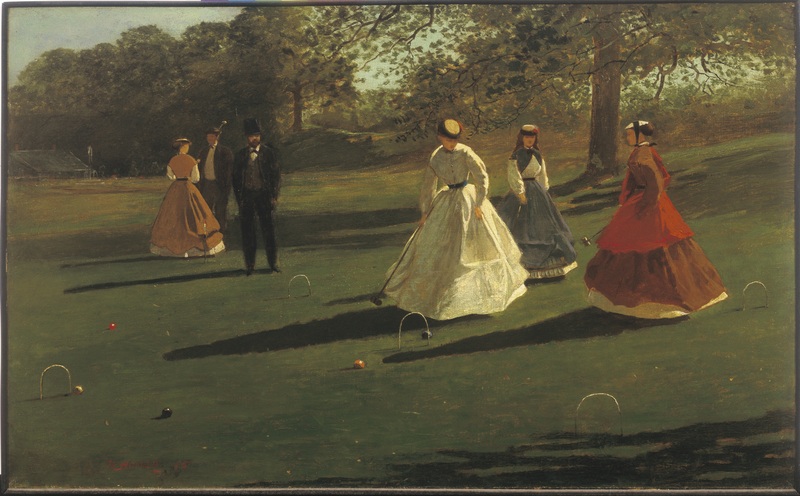 In Croquet Players, Winslow Homer captures America’s first great sexual revolution. 100 years before riding in cars with boys, the pill, and the Summer of Love, young men and women were getting frisky with a naughty new game called croquet. It was the swinging ‘60s, 1860s, that is. Eligible bachelors were back from the Civil War and ready to play the field. Luckily, the latest trend was a gender-neutral sport that allowed them to do just that, turning unassuming lawns into the 19th-century equivalent of the backseat of a limo on prom night. Both men and women could participate in croquet, providing a veneer of socially appropriate context under which to flirt out of earshot of nosy chaperones. Risque new fashions featured sporty outfits for women offering glimpses of underskirt and the occasional flash of ankle. Men could kneel to place a lady’s ball and sneak a closer peak. A bold chap might even contrive to place his arms around his female companion to demonstrate proper stroking technique. Furthermore, it was a sport at which women could surpass their male counterparts, offering a dainty pretext for toying with some innocent smashing of patriarchy. Freud could do wonders with repressed Victorians with long sticks, literally banging balls, penetrating slots and playing dominance games. Indeed, many a dirty minded art historian has tried to do Freud proud. This is one of four of Homer’s major paintings on the theme of croquet, and like most of the series it seems in tune (however unconsciously) with this undercurrent of sexual tension. Homer was something of a dandy and loved modern fashion, the daily interactions of the elegant bourgeoisie, and natural outdoor lighting; fascinations he shared with impressionist contemporaries like Manet, who also painted croquet scenes. The Albright Art Gallery bought Croquet Players in 1941 from Knoedler & Co., a leading New York art firm fraught with scandal. Knoedler acquired and sold Nazi looted artworks in the 1950s, including paintings by Matisse and El Greco. The firm closed in 2011 following the revelation it had been selling fakes painted out of a garage in Queens, including forgeries of Pollock, Rothko and de Kooning. As this is an American work legitimately acquired before World War II and decades before the forgery ring, we know it’s 100% genuine and Nazi free! Gems, Gerald, Linda Borish and Gertrud Pfister. Sports in American History: From Colonization to Globalization. United States: Human Kinetics, 2008. Prown, Jules David. Art as Evidence: Writings on Art and Material Culture. New Haven: Yale University Press, 2001.